I'm looking to build a new Cocktail Class Racer (aka Skua -as published in the 1939 The Rudder magazine.) This is an old-time simple racer with a new single-class racing league that's just starting up - first full season is in 2011. The plans have been updated slightly for modern all marine plywood construction. If you want one, let me know and I can build one for you! Has been confirmed by Frank Zorkan that it's one of his, a Z-Craft runabout. CLICK HERE for photos. Big open 16 footer for all around use. Transom and all wood seats have been replaced, awaiting a sunny day for first re-launch! CLICK HERE to see the progress. Dragonfly is a classic outboard speedboat from the pen of prolific naval architect William Jackson. It dates to a least August of 1941, in Science and Mechanix magazine. 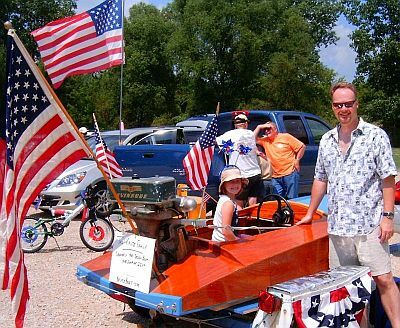 This is a vintage hydroplane design with extended tails which help get on plane faster, and makes the back end extra bouyant when coming off plane, is suited for either tiller or steering wheel setup, and should run in style with any antique motor from 4HP on up to large Speeditwins or Quads. Construction features plywood planking, southern yellow pine and white oak framing, epoxy adhesives, silicon bronze fasteners, polyeurathane paint, and multiple coats of varnish. "Attached [please find the] picture of the Dragonfly that my two buddies and I bought for $25 when we were kids about 12-14 years old. I'm the skinny kid in the back of the rowboat sitting by my Dad's 4.2hp Champion. We had just broken a shear pin in the borrowed Johnson outboard in the Dragonfly when this picture was taken. Later we saved and bought a 9.7hp Evinrude Lightfour which threw a rod and ended our fun with that Dragonfly boat. I don't remember what ever happened to the Dragonfly but it is gone. The picture was taken between 1947 to 1949." "My Dad built one in the early '50s,I ran a 7.5 Merc and then a KG7 with a speed prop. I ran every day all summer for about ten years with no problems or accidents. It is a great boat." Note: Comments sent to me by these gentlemen about their Dragonflys are not endorsements of my boat, but rather their experiences with the design.